Meanwhile, over in the humanities and social sciences, many researchers (indeed most academics in some disciplines) remain a one-person enterprise (‘lone scholars’) throughout their entire careers. Their co-authoring is rare or evanescent. The PhD students they supervise work on other topics that they largely choose and define themselves. And lone scholars often acquire no followers or disciples. By contrast, most researchers in the STEM sciences, and perhaps a majority now in social science, merge and amalgamate their efforts in permanent or recurring co-authoring teams, that endure and tackle more complex projects in a labour-sharing way. Some academics build medium size research teams, and others enter really large-scale projects and programmes of work. Whatever your field and stage of career, an analytic framework developed for start-up firms, called the ‘business model canvas’, may help academics or researchers in thinking about and evaluating their choices around committing to a given stream of research. My chart below shows how this approach can be adapted to the academic context, and used to assess the pluses and minuses, the likely ‘returns’ and risks, of investing in different projects or streams of research, when those decisions also define a career pathway. 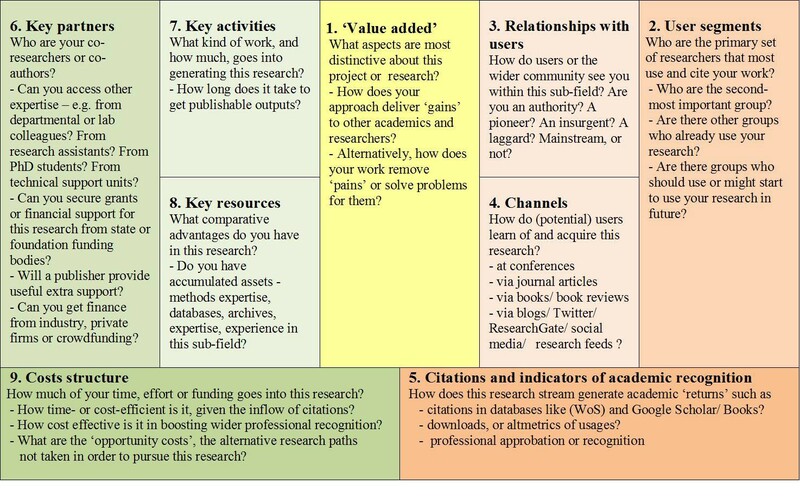 The final element on the right hand side of the canvas is box 5, which asks what academic return (what ‘revenue’ in business terms) does a research project generate, or might it generate in future? How many citations does it create already for you, or might it create in future, measured perhaps both realistically and hopefully (at a maximum)? And if not citations, are there alternative indicators that this work is well-regarded and making a positive contribution to your professional standing? These cues might include altmetrics and usage statistics, fast indications of future citations seedcorn. Or they might be approval in professional circles, or endorsements in government/official audits (like the REF process in the UK or the ERA in Australia)? Perhaps materials that attract few readers or citers may none the less elicit a positive reception in university promotion boards, or professional or academic elite academies, many of which sometimes seem to value highly esoteric research that no one reads. (By contrast, simply getting a piece of hard-boiled and inaccessible research into a ‘top’ journal, only for it to be neglected by the rest of the discipline thereafter, is a pointless activity — and may even detract from your CV). Turning to the left-hand side of the canvas, the focus shifts to what is used up, or lost for good, in pursuing a particular project or stream of work. What specific activities are involved in developing it (box 6) in terms of lab work and experiments, fieldwork, archival research, library work, running data analyses, and allocating time to theorizing, writing/re-writing, and publishing? Offsetting this may be key resources (box 7), such as a comparative advantage in terms of methods, theory grip or theme; or a track record of previous work in the sub-field. Contributions by co-authors, other members of the research team, research assistants, PhD students or post-grads (and the finance needed to support them) can all make a difference (box 8), as well as wider or more diffuse support from your department or lab. Outside of intensive teams in labs, or socially close-knit sections of departments, the critical inputs or contributory expertise of colleagues may seem very episodic, or elusively ephemeral — a ‘climatic’ influence akin to how the weather shapes your moods. But the salience of stimuli from colleagues in seminars or conferences in re-steering your efforts or helping overcome blocks is still considerable. I’d welcome comments, critiques or alternative suggestions via email to: p.dunleavy@lse.ac.uk.